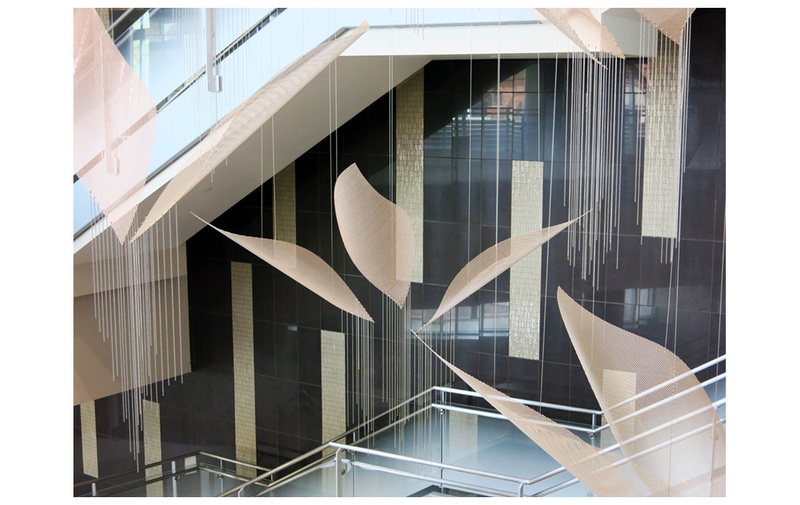 This suspended sculpture installation, in a military healthcare facility, references flight with seventeen lightweight perforated aluminum “wings”. Four to six feet long, with an easy to maintain champagne powder coated surface and suspended in the atrium, they have the visual effect of floating in space. Strands of bead chain, three to five feet long, suggest contrails. The highest wing hangs thirty-two feet above the ground floor and the bottom of the lowest chain is twelve feet above the ground floor, making the overall height twenty feet, with a diameter of approximately twelve feet. In 2011, the interior designers at RLF Architects in Florida selected one of Talley Fisher’s works in Macau to form the basis for a totally new suspended sculpture for the Malcolm Grow Medical Clinics and Surgery Center at the Joint Base Andrews (Air Force and Naval Air) in Maryland near Washington, DC. They saw visitors entering the multi- story lobby through a space filled with natural light. Centered in the space by the stairs, they envisioned “reflective sculpted wings in flight – abstract metal wings of birds or machines suspended on cables gently swaying in air currents with trailblazing contrail speed lines, instantly reminding visitors and staff of air travel – past, present and future.” And five years later, that is what Talley created for them. The integration of this elegant and graceful work of art ads interest, content appropriate to the space, a focal point and way finder leading to the central atrium and stairs to the upper floors. Sometimes the collaboration process includes many people and takes a long, but fruitful, time. It began with Art Consultant, Fran Davidman, contacted in 2010 by interior designers at RLF Architects regarding a healthcare center. They determined the color, location, and that Talley’s wing-like sculpture was ideal. Throughout the project, they supplied updated plans and elevations to Talley for items like design presentations, specifying a structural support system and locating suspension points in the ceiling. Workplace Solutions, Inc. won the contract from the U.S. Government to “outfit” the entire facility, and the sculpture went under their purview. In 2013, she contracted with them and began listing design concepts and specifications for fabrication and installation. Also included were descriptions, renderings of the sculpture, details of materials, fabrication, shipping, timelines, hardware, installation preparation, equipment and labor, all of which they submitted to the Government in order to receive payment for the purpose of suspending “Contrails” in the lobby. 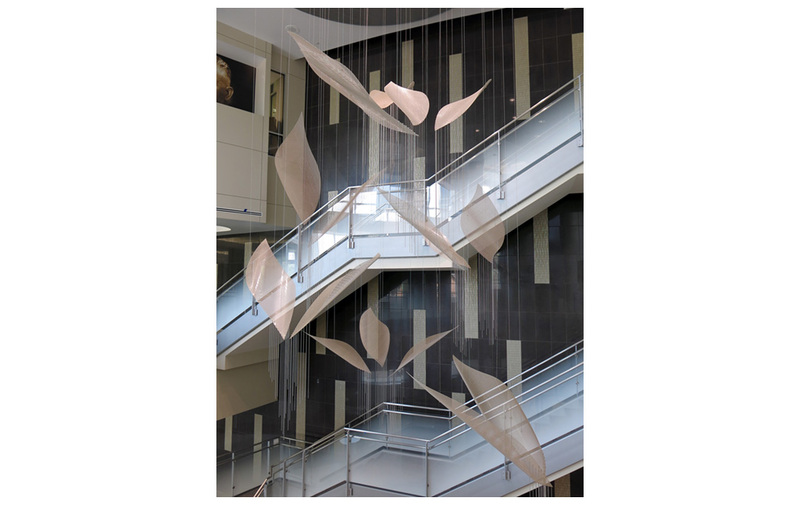 Three years later, their Project Manager helped with on-site installation specifications, while Fine Arts Specialists, Talley’s installers, did an excellent job of closing a successful collaboration of many who brought the beauty of flight to the atrium.